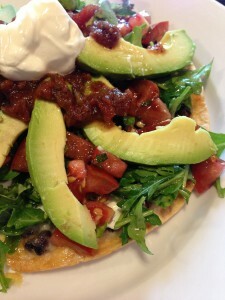 Tex-Mex Tortilla Pizza. 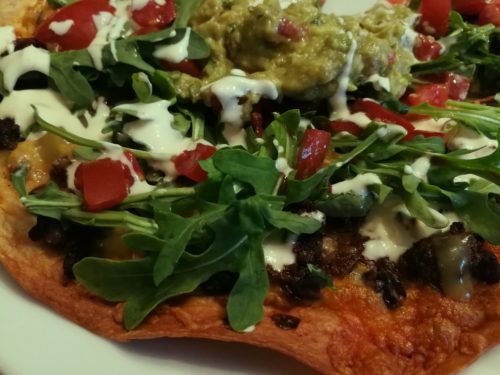 A take-off of the California Pizza Kitchen Tostada Pizza on a real pizza dough, my Tex-Mex Tortilla Pizza is an easy way to have pizza and a salad all in one! 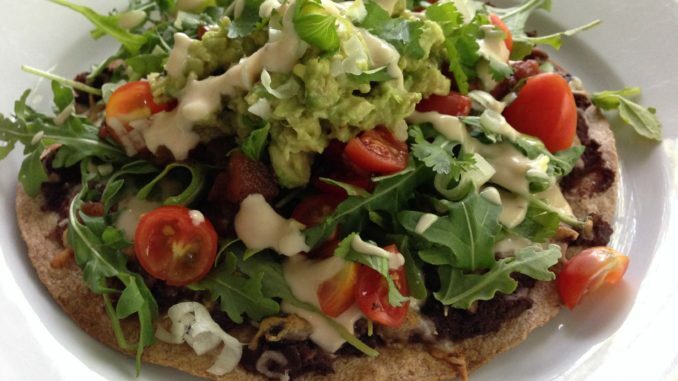 This is really a “big salad” on top of a bubbly cheese and black bean smothered baked tortilla! In my version, just shred some Monterey Jack cheese onto a flour tortilla with some black beans and melt in the oven. The tortilla will become crispy just like a pizza crust. 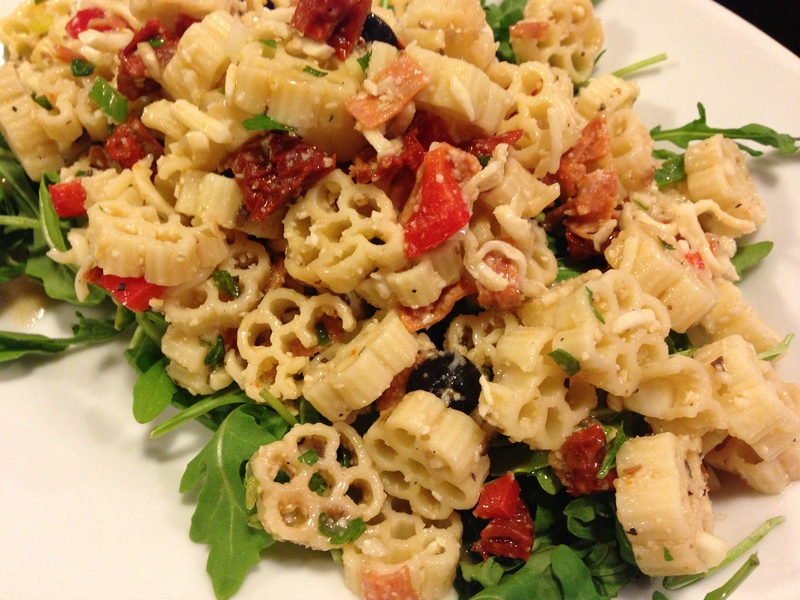 For the greens that go on top, you can use arugula, shredded Romaine, or torn butter lettuce. Mix the greens with my Lime-Cilantro Dressing. Then add some chopped tomato and sliced scallion. 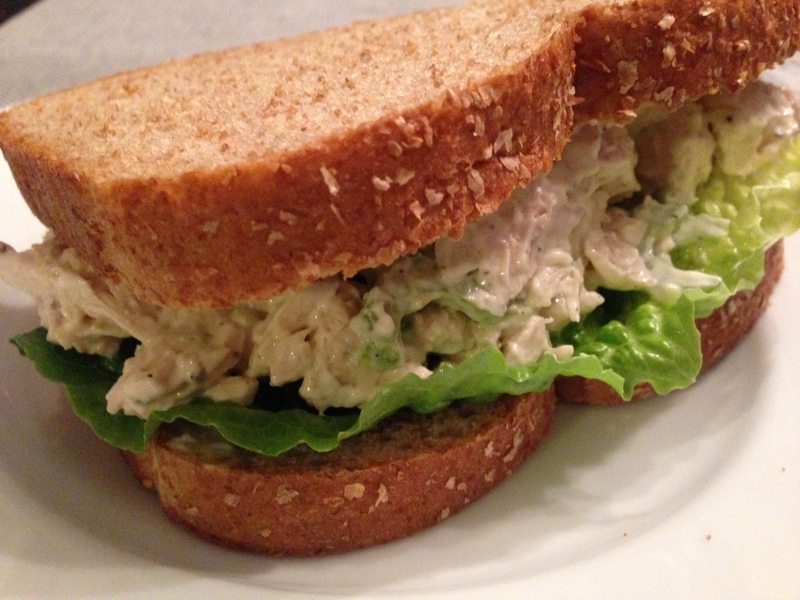 Garnish with chopped cilantro, sour cream or Mexican crema, and avocado slices or even dollops of guacamole. I don’t use a garnish of corn tortilla strips in my version since the crispy flour tortilla is already there on the bottom. 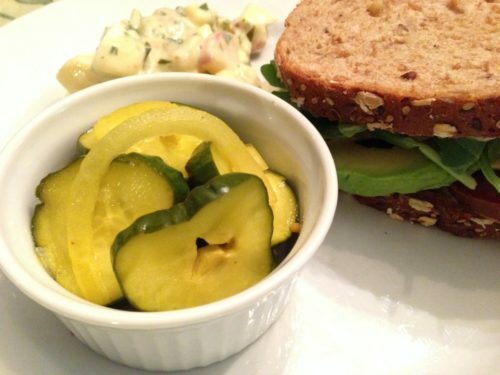 You can add crispy tortilla strips or crushed tortilla chips if you like additional crunch. 2. Place the two tortillas next to each other on a parchment-lined cookie sheet. 3. Sprinkle 1/4 cup shredded cheese on each tortilla. 4. Top each tortilla with half the black beans. Season with some salt. 5. Sprinkle the remaining cheese over the beans. 6. 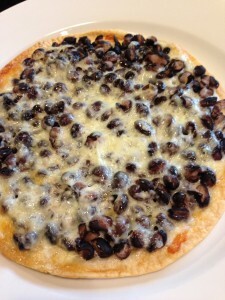 Bake the tortillas, beans, and cheese for about 15 – 20 minutes until the cheese is melted and the beans are hot. 7. Remove the tortilla pizzas from the oven. Set aside. 8. 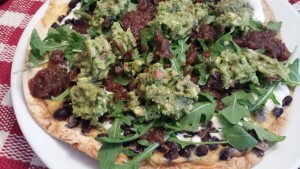 In a medium bowl, mix together the arugula and the lime-cilantro dressing. 9. 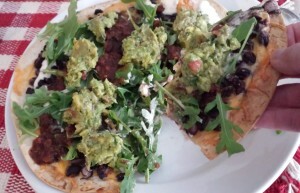 Divide the arugula between the bean/cheese-topped tortilla pizzas. 10. Combine the tomato and scallion with 2T of the dressing. Divide tomato/scallion mixture between the tortilla pizzas and drizzle some salsa on each. 11. 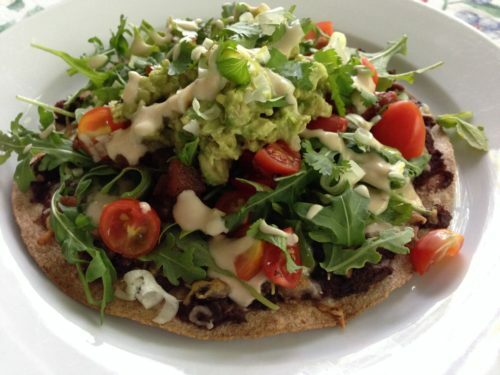 Place a dollop of sour cream or Mexican crema, or drizzle some Chipotle Cream Dressing on each of the tortilla pizzas. 12. 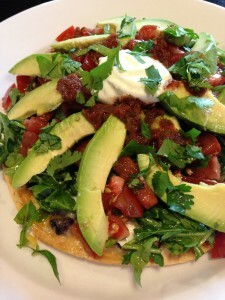 Arrange the avocado slices or dollops of guacamole on top and then sprinkle with the chopped cilantro. 13. Serve on plates. 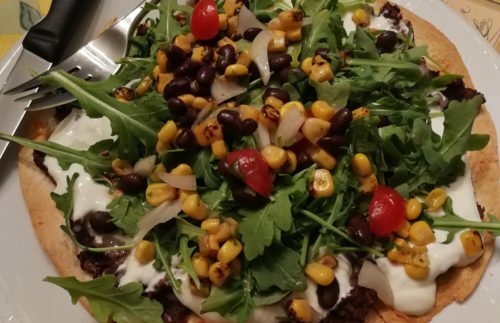 If you are going to serve more than two people, cut the tortilla pizzas into slices after you remove them from the oven, and before you add the arugula salad. Serves 2 as a main course, 12 as an appetizer slice. Serve my Chile Con Queso with Smoky Chipotles and tortilla chips alongside. 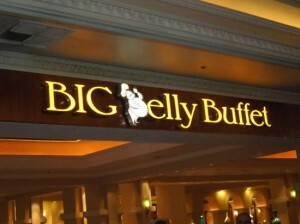 Variations: Add diced cooked chicken breast, chilled shrimp, or cooked seasoned taco meat after the baking step. 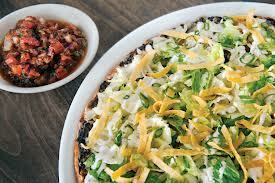 Spread a thin layer of refried black beans on the tortilla before baking instead of using whole black beans. Shred some Romaine lettuce instead of using arugula. 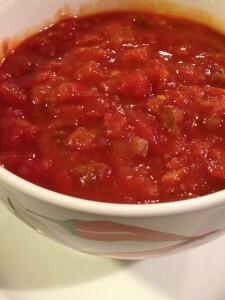 Use your favorite salsa or try my recipe for Richard’s Party Salsa. Omit the sour cream or Mexican crema. Add sliced black olives. 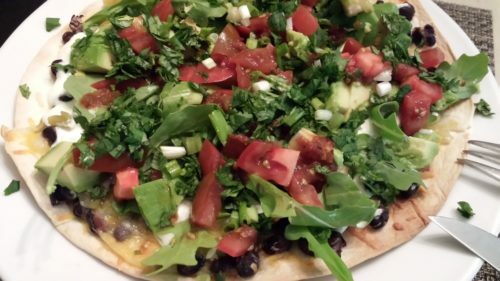 Turn this recipe into a big salad by omitting the tortilla and just mixing the unheated beans and cheese into the greens.